Little Tibet - Mcleod, with love. Mcleod, over the last few years, has become an extremely popular destination. 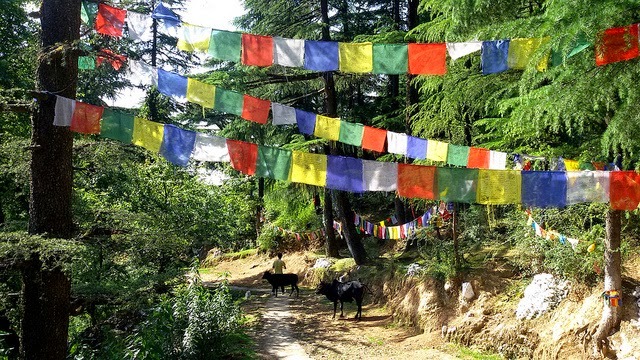 It is a suburb of Dharamshala in north western HP; and is most famous for the Tibetan population that lives here in exile. 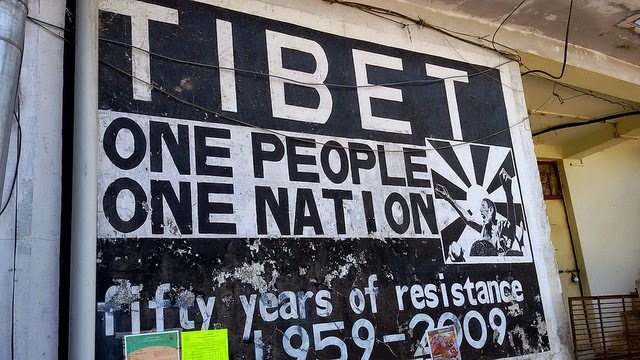 In fact, the Tibetan population in exile has its headquarters in Mcleod. 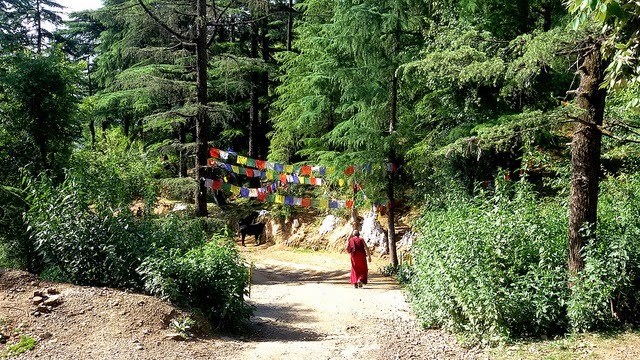 Nestled in the Dhauladhar range (part of the outer Himalayas), it is also called Little Lhasa. is also nice. But wait, let's discuss the stay later. Mcleod is small congregation of smaller roads; that are always on the brink of going into complete chaos - especially during the weekend, when those small tempo travellers bring tourists from neighboring Lucknow or Chandigarh sometimes block the road. That's when the otherwise quiet and peaceful Mcleod falls prey to traffic. The town has hardly 2 or 3 main roads - and most are filled with stores selling artefacts or eateries serving different varieties of momos. You get Tibetan paintings called Thangkas. 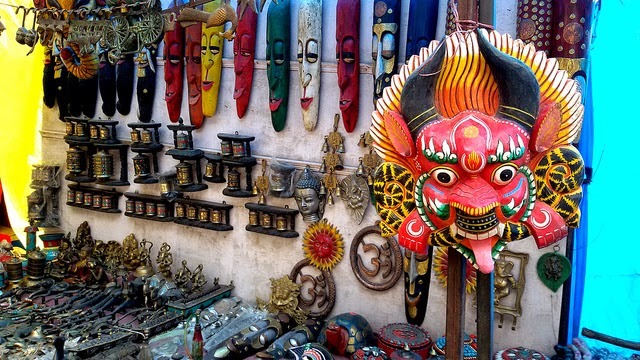 You can buys some cds in the market with beautiful Tibetan hymns of 'om mani padme hum'. 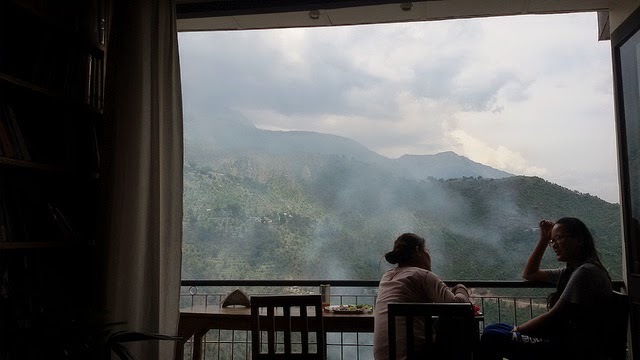 Basically, if you're the kind who likes to splurge on every trip and carry home special souvenirs, this is your hill station. Our first tourist place was the very famous 'Dalai Lama temple' - which was fortunately a 10 minute walk from New Varuni House. When I used to think of Tibetan temples, I used to think of mountains, monks, silence, Tibetans walking around quietly in red and yellow robes, chanting etc (Some far eastern movies did influence me). The Dalai Lama temple is not far from what I used to think. In fact, you could spend hours sitting on the cool floor and get lucky to have a monk sit with you and talk about his journey from Tibet. 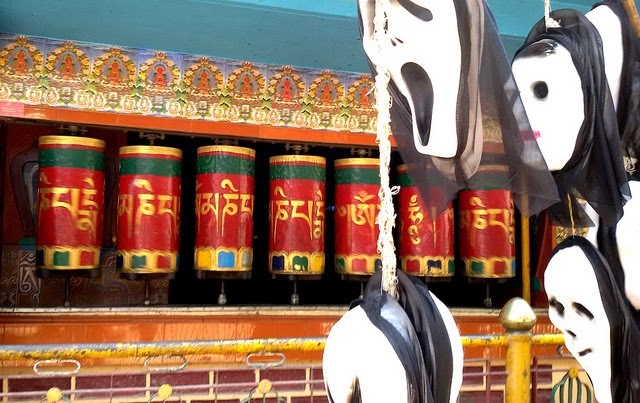 I liked the Prayer Wheels, the sound they make when you roll them resonates and echoes. It's a great feeling, and makes me wonder how many souls have prayed or wished here. The prayer wheel is said to add the good karma in your life, and purify the bad karma in your life. Outside the Dalai Lama Temple, (bang outside the gate) - is the 'momo lady'. 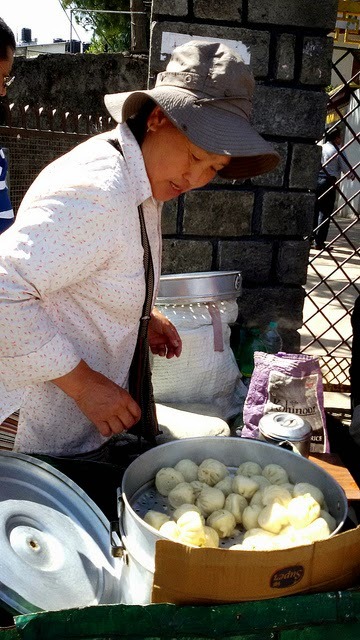 She makes the most amazing spinach and cheese momos! We walked around a bit - as I said, the whole of Mcleod is divided into 2 or 3 roads - and if you explore a bit, you will come across these small lanes - one which I found on the way to our hotel. 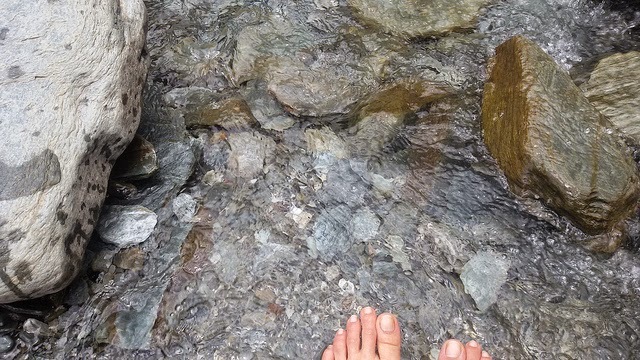 I was ecstatic - like I have found the secret place where all monks go. We also visited the Bhagsu falls and sunset point (vista points). Bhagsufalls is great to look at - again, since I had gone on a weekend, it was crowded, and sadly, very littered. But what we did was, we found our own spot - with a great view - and occasionally would go and dip our legs in the cold pani of the waterfall. 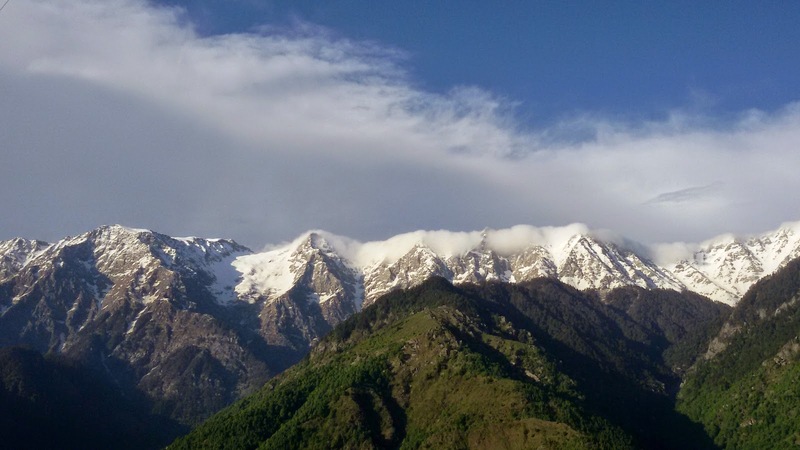 The vista point ( I think it was Naddi ) near the sunset point is breath taking – snow clad mountains looking at you majestically. We walked a little farther down the road – to get better views. 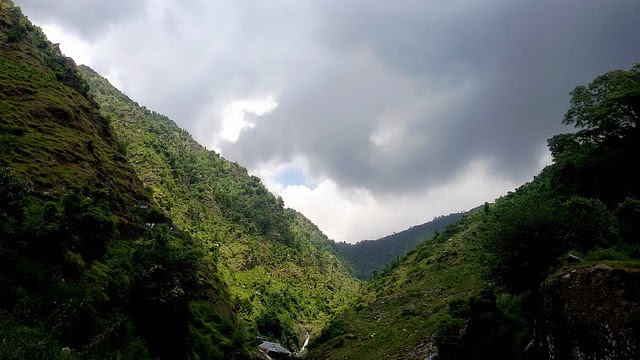 We sat by the road for a while, admiring how beautiful the Dhauladhars were, and then realized that we ought to visit Nepal to the see the Himalayas. Before sunset, we went to the other side to see the magnificent colours of dusk. From clear blue skies, to yellow – orange – pink – the sky kept changing its colour, as though it knew it had a spectator watching it eagerly. There was a small stall selling maggi and chai where all the tourists had gathered to watch this beautiful spectacle. On the way back, we saw the dal lake. We walked around the lake – it was quite eerie after the sunset. We had hired one of the many cabs that are easily available. Now back to our stay. The hotel we had picked served the best aloo parathas for breakfast. It was clean – and the view was nice – On retrospect, I realize there possibly can’t be a bad view in McLeod. 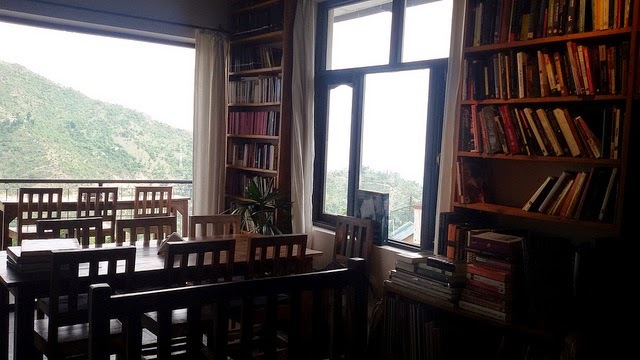 A personal highlight for me on this trip was ‘Illetarati’ – a library and a café in the middle of nowhere – which also boasts of amazing views. A friend who’s living in McLeod suggested this place. I will be grateful to him for this. The walls are completely lined with books and more books. 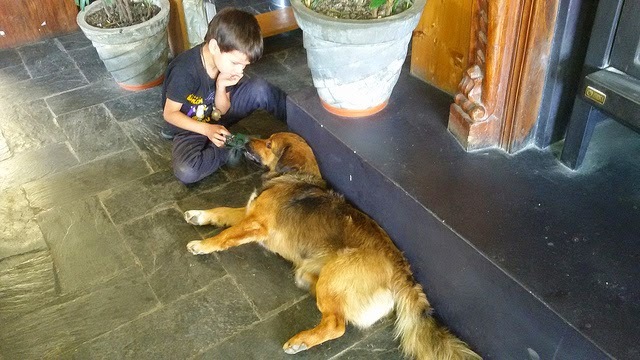 There is a friendly dog there too – an added plus if you’re a dog lover. Sit on of one of the balconies, enjoy the view, drink a coffee, read a book, play the piano or the guitar – basically unwind. Precisely why you ran away from Delhi in the first place. Our hotel was quite nice – recommend it to anyone going to McLeod. We booked via Makemytrip.com - the hotel room costs us around 1200 per room. If you want to see all that there is, I strongly recommend two places where my sister and I missed. St Johns Church and Narbulingka Institute. I believe they’re must see places. If you’re visiting Illetarati, remember it’s a quiet place, not a loud place – so if you want some quiet time, Illetarati is perfect! We went by bus – it’s a comfortable overnight journey – you wake up in the lap of snowy mountains. We booked via Redbus.in - Round trip per person comes to approx 2500. Thanks for making me revisit this beautiful place through your blog and pics. I bought a Tibetan dress which i still sometimes wear and cherish. I find this place to be very peaceful, calm and sacred. I too am a travel buff and have travelled many places... do visit Sikkim and Ladakh. Hi HIna, Thanks a lot :) Am glad I could make you revisit this beautiful place ! I shall definitely check out your blog. Cheers ! What a travelogue! Loved every bit reading it. I found the book cafe a must visit. Being a book lover myself I find it irresistible. Hi Gitanjali ! Thanks a lot :) You will surely love Illiterati !